Well .... it's been a while since I've talked you guys through what I have been LOVING lately so I thought it was about time! Now I'm going to start with the two randoms. Metcalfe's Skinny Dark Chocolate Popcorn Thins and Twinings Gingerbread Green Tea. 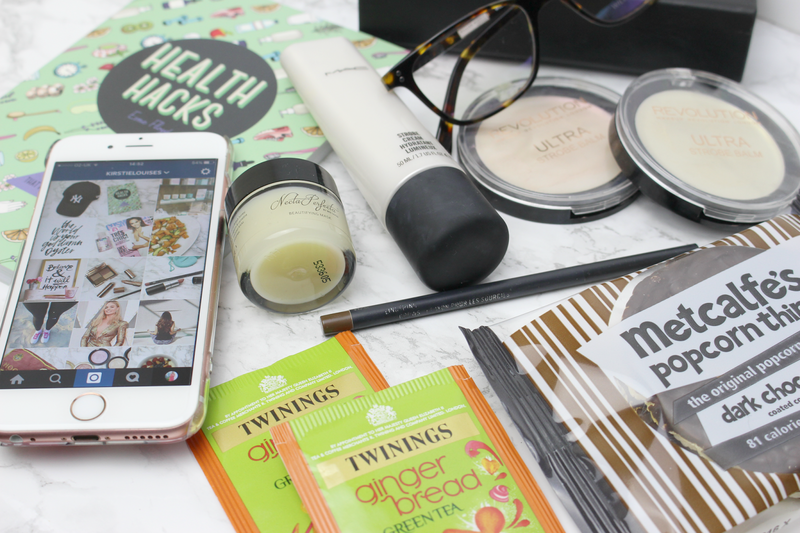 Yes, I've talked about the tea before on here in my January favourites but it's still a strong, strong favourite of mine! This stuff is so, so good - tastes just like gingerbread, perfect for a little sweet fix! The popcorn thins are literally da bomb. I tweeted about them not long ago when I had stumbled across them in co-op and then the lovely people at Metcalfe's Skinny sent me a whole box full (I know, I couldn't believe it either!) - it's taken me all my strength not to sit and eat them all I tell ya! Popcorn is literally my favourite food ever and I've got such a weakness for dark chocolate at the moment so this combined is just a WINNER. I mean .... it's basically just shiny highlighters right? Well.... I've been going through these 3 like no bodies business! The MAC strobe cream (bottom swatch) is a total beaut - for £24 yes it's a bit of a splash out, for me anyway, but this is gorgeous and I'm really looking forward to rocking it with a tan. I miss being tanned so much! The other two are by Make Up Revolution. Euphoria* and Hypnotic* - at only £5 each these are a bargain! 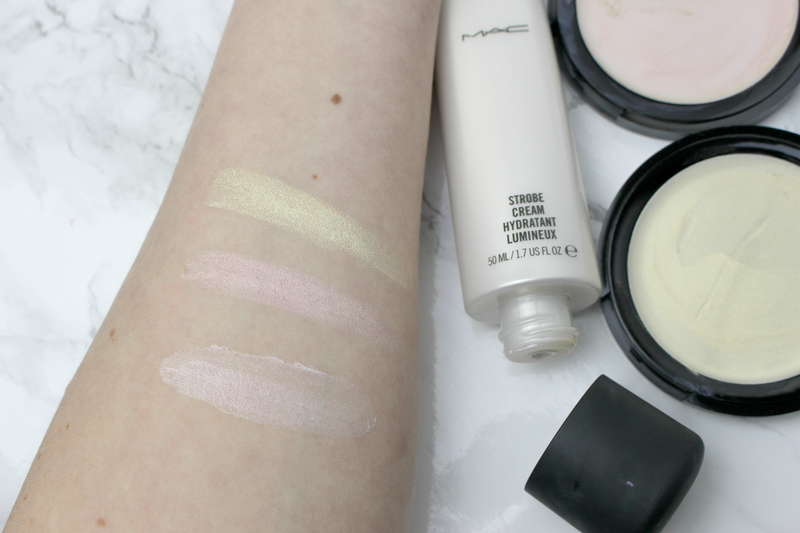 One a silvery pink based cream and the other a golden shimmer cream - I'm obsessed. Since getting a new prescription and starting my new job, glasses have become my life. I actually can't go through a day without them so new pairs are always a good thing! I was recently sent this pair by William Morris London*, snazzy right? 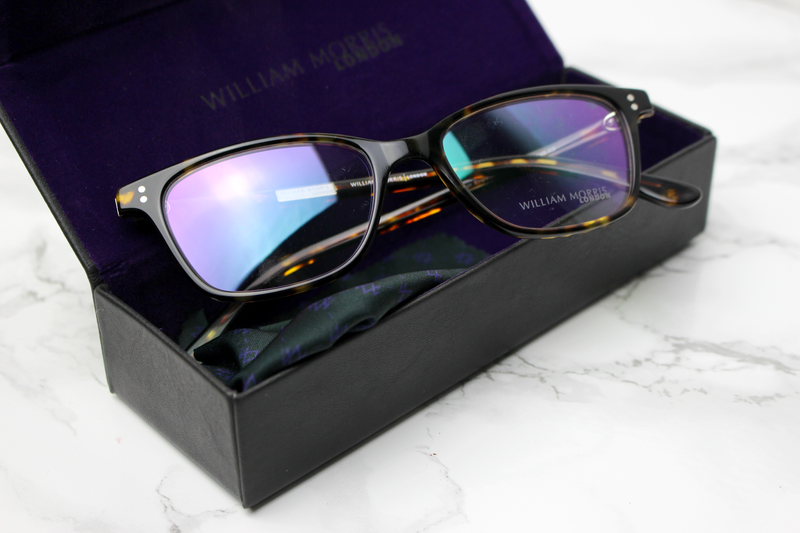 This pair is actually from the 'Silver Collection' - this collection is super special as they have started to reuse the original shapes and designs that William Morris started out his business with 20 years ago! You may have spotted me in them on social media recently - (here) - I totally look intelligent right? The quality is amazing, everything from the case to the arms, I'm so, so pleased with them. MAC's eyebrow pencil in Lingering has changed my life. God lord how had I not tried this before?! I LOVE this eyebrow pencil, the shade is perfect for me, it fills in my sparse areas without making them look too bold and OTT and it lasts all day - this will be repurchased over and over again. As you can see I've already rubbed off all the writing on the packaging and I've only had it a month! I've only tried it out a couple of times but I've loved the results! Made for a multitude of things you can use this skin perfecter n everything from your scalp to your elbows! Hydrating, soothing and moisturising a tiny bit of stuff goes a long, long way - with the horrible weather we've been having lately my hands have been suffering, this stuff has been great for popping on at night before I head off to sleep for a deep hydrating treatment! I really want to try it out on my scalp as a treatment next! Health is something I'm trying to take alot more seriously at the moment, I'm ona a real mission to make myself feel better and change my ways - so far, so good! This book was something I picked up from ASOS as something to help me with all those health problems I seem to have day in day out. With it's quick and easy segments to read Health Hacks is so helpful and something I actually enjoying reading through! There are tons of different sections to read through so weather it's being bloated or something to help with a rash - there is a top tip on how to solve it! that book from Asos looks great! Might need to buy it and read it! 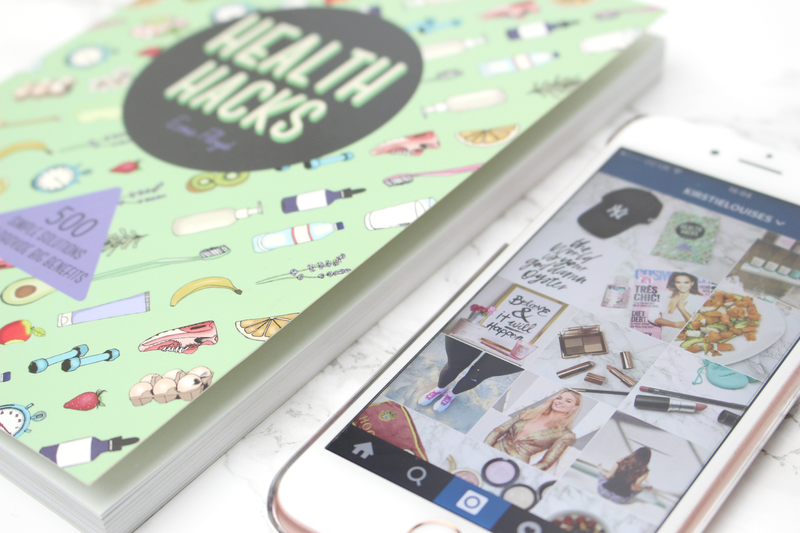 The health hacks book sounds interesting and definitely a good read. I want to try the MAC eyebrow pencil out, it sounds great. The gingerbread green tea sounds delicious! I haven't been drinking tea lately, since going back to uni I've been relying on coffee to keep me awake - but I have to add this tea on my list! The Bee Good moisturiser seems great, I hadn't heard about the brand before but it must be the perfect product to use at the moment to prevent dry and sensitive skin on the face and hands. I've heard fab things about Strobe Cream recently and I know I have the travel size version somewhere I need to give it a real go! I'm obsessed with the twinings dessert flavoured teas! They're gorgeous, and gingerbread is my fave!